There are several great places on Kauai to catch a romantic sunset or sunrise. Sunsets are often visible from the Na Pali coast (weather permitting), since the coast faces roughly northwest. Polihale State Park faces almost due west so the sunsets can be great there. 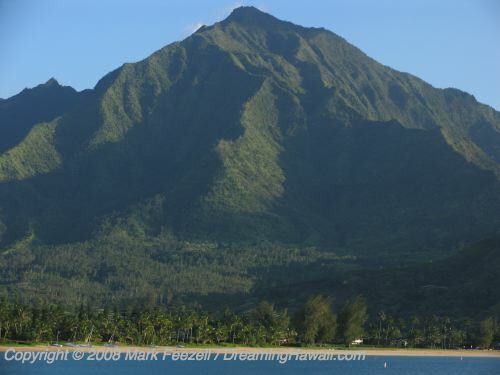 The Princeville Resort area and Hanalei Bay have great sunsets behind the mountains to the west and south. Of course, the sunrise is visible from the eastern end of the island, but there aren't as many great places to watch it here. Still, a sunrise over any ocean in Hawaii is a treat. Another great place for both sunrises and sunsets on Kauai is Waimea Canyon. As the morning sun moves higher, the rays of sunlight gradually illuminate the canyon below, throwing the rich colors into beautiful relief. Although it is smaller, Waimea Canyon is in some ways even more dramatic than the Grand Canyon, because Waimea has so many striking shades of reds and greens.